USHandball.org Reports, Brooklyn, NY- The 8th USHA National One-Wall Big-Ball Championships kicked off this afternoon [Fri, June 26th] at J.J. Byrne Playground (4th & 4th) with preliminary and first round action. The match of the day took place between Kadeem Bush/ Joshua Milian and Hector Velez/ James Aguilera in the Men’s Pro Doubles. 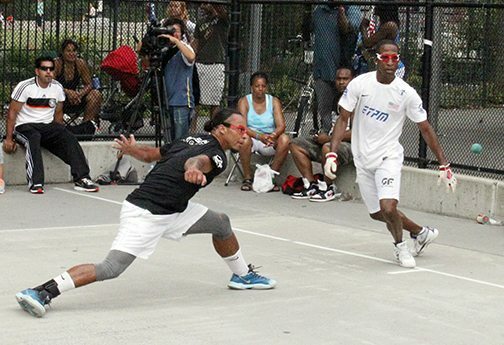 The two teams waged a back-and-forth battle before Bush and Milian prevailed 25-23. They’ll face last year’s finalists and No. 2 seed William Polanco and Andres Calle in the quarterfinals. Timbo Gonzalez steps in for a return against Tywan Cook in the 2014 Men’s Pro Singles final. Three-time defending champion Gonzalez will attempt to win four-straight titles. Timbo Gonzalez begins his title defense tomorrow at 11:30 am (Eastern) when he plays Eddie “Shooter” Ramos. Gonzalez will attempt to win his fourth-straight Men’s Pro Singles championship. Tywan Cook hopes a third time will be the charm as he has reached the final twice only to fall to Gonzalez. In Women’s action, Danielle Daskalakis looks to win her third consecutive crown. Danielle but Gonzalez in Most matches will be schedule for Saturday and Sunday with some preliminary round matches played Friday if necessary. In the event of rain, we will post updates here and at our Facebook event page. Matches will start at 1pm at J.J. Byrne Playground (4th&4th), June 26-28. PLEASE NOTE: Draws and times are subject to change! Please check match times the day of your event.